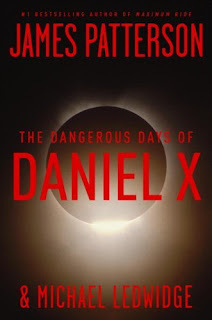 Mason & I were chosen by MotherTalk to review the newest young adult novel by James Patterson, The Dangerous Days of Daniel X. It is his latest attempt to entice reluctant readers into the wonderful world of books - last summer I got to review one of his installments in the Maximum Ride series and found it an adequate joy ride for the young teen set. This story is definitely aimed more at the boys, as is obvious by the darkly alliterative title. We decided to use it as our bedtime book (Paige wanted in, too; she likes to roll with the wild ones now & again) and immediately recognized parallels to our favorite Boy Who Lived, Harry Potter. Daniel is orphaned as a toddler by evil forces that kill his mom and dad then discovers he is not a Muggle Human but rather has supernatural powers and must fulfill a quest to destroy the forces that murdered his parents. However, Daniel doesn't acquire friendly mentors nor does he set off to join other young magical friends but instead goes solo as a vigilante alien hunter. As in his other young adult books, Patterson relies heavily on teen slang and hip pop culture references to establish voice in his characters. My kids thought this was pretty cool, which is fine because they are the target audience, but I found it somewhat desperate ("I really AM a fifteen-year-old boy! Seriously! I know about rappers and stuff!") and it left me wondering about the novel's shelf life - in a few years, Shia LeBeouf will [hopefully] be a more mature grown-up actor, which will make him unknown and/or boring to new tweenage readers. Another trait I've noticed in Patterson's writing is his desire to sneak in references to environmentalism. Daniel slyly remarks about pollution, global warming, recycling, and the importance of taking care of Nature. Certainly not a downfall, but it makes the main character sound less like a young Batman-on-a-mission and more like a young Green Party candidate. The overall storyline is definitely interesting despite its sci-fi Harry feel at the opening. Daniel has the fascinating, and sometimes poignant, ability to conjure people from his past; they behave independently of his thoughts and can be of comfort as well as protection to him. We very much felt close to Daniel and wanted him to win the day. The wicked aliens out to defeat him are indeed nasty creatures, though the head baddie has an English accent and a professor's vocabulary; we could never quite figure that one out (maybe another bizarre nod to J. K. Rowling's dynasty - a Dumbledore from the Dark Side?). In the end, we decided The Dangerous Days was worth our summer nights and hope to see Daniel X around the universe again. Go ahead & give him a spin. So many teen books with the dead parents theme. Hmm, I cannot imagine why. I think I felt pretty much the same way about the book. Has you son gotten into the Cirque Du Freak series yet? Those are excellent books. I wish I could get my kids caught up in something. Their interest in Twilight is waning. oh i liked your review. i am now more inclined to give it a go, with your blessing. I am a Patterson fan, but have found his teen books (Maximum Ride) to be not so hot, a sentiment shared by my teen. But this one intrigues me. I'll wait for the paperback, though.